Many students ask me how we’re able to teach three full stacks when the majority of other coding schools only teach one. My typical response is, until 2013, we had the same problem, and could also only teach one stack! We knew we could do better. In 2013, we introduced the second stack and taught those two stacks until 2015. After years of continuous iteration in the curriculum and teaching strategies, we were finally able to reach our goal and teach a three full-stack curriculum. What we were once able to teach in three months, we could now teach in two, which meant that we were able to teach at third stack during the third month of the program. Graduates with stronger skills and opportunities. After the students learned the materials quickly, we focused more on the advancement of their logical reasoning and coding skills through algorithms and data structures to prepare them for rigorous technical interviews after graduation. Compared to my first batch of students who learned only one stack over a period of three months, our students now learn three to four times more than what I was able to teach back in 2013 when we were only teaching one stack. We’ve always believed learning to code is just like learning a new language. We know there’s a way for someone who has never coded in their life to be able to think like a computer in an accelerated way. But for the first four years of Coding Dojo, a constant struggle was to understand exactly how to unlock a student’s approach to coding, especially if they had no previous coding experience. At Coding Dojo, we consider the classroom to be a place where we get to experiment with different teaching methodologies. I have personally experienced great teaching moments where concepts which have generally taken previous students 2-3 full weeks to grasp fully, now learn in a matter of days. 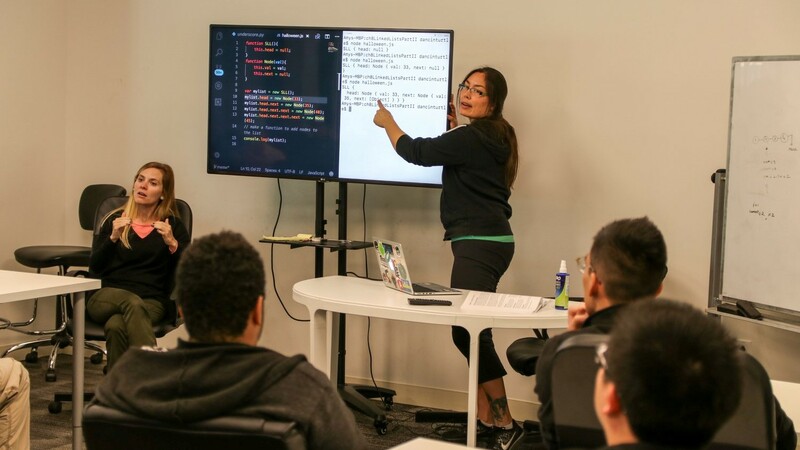 We are always striving to improve Coding Dojo, so when we discover a better way to teach, we update our curriculum so that all future students benefit from new teaching methods and discoveries. Looking back, I remembered in 2014 we struggled to teach the concept of Object Oriented Programming to inexperienced students. This was a frustrating time. After numerous attempts and failures, I finally had an epiphany and came up with a new experiment on how to teach OOP that I hadn’t tried before. It worked! The next day, my students who struggled with the concepts of OOP, all got the concepts right! This was a first. To make sure that I could scale the concept I created a 7-minute video about it and put it on our platform for other students to utilize. Since then, my students have understood the core concepts of OOP with the help of that video. Moreover, to internalize those concepts, I gave them new practical, hands-on assignments that we continue to use. Over the years we’ve gotten much better at teaching people how to code and do algorithms, and we’ve learned that the biggest challenge is effectively helping people understand how to think like a computer. The core issue is that computers are more logic-based than humans who think more pattern-based. After months of iterations, we’ve had several breakthroughs that have helped our students. We discovered a teaching method to help people with zero coding background learn how to think like a computer. I’ve always believed that if we explain complex concepts easily, it can be learned very quickly. In other words, if it seems complicated to a student, I assume we just haven’t discovered how to teach the concept in a way that is easy to understand. We created an algorithm app for our students. This has been a great way for students to learn by doing. It helps students understand how codes work, like the functions of variables, arrays, and loops. Once they’re done with the basics, we take them even further to expose them to complex data structures while they are in the bootcamp. Coding Dojo caters to individuals from a variety of backgrounds and skill levels. Our bootcamp isn’t only geared toward beginners. We also have experienced developers who join our school. Therefore, it’s critical that we get the beginners quickly up to speed so that starting on their 3rd week in the bootcamp, we can get people who never coded in their life, be able to do algorithms with data structures. Now, we’re proud to say that our students are exposed to the concept of single-linked lists on their 3rd week of the bootcamp, and for the remainder of their time, they learn and practice whiteboarding on advanced concepts such as Binary Search Tree, Tries, Graphs, Stacks, Queues, Hash Tables, Heaps, Various Sorting Methods, etc. We’ve also improved Coding Dojo by offering full-time and part-time programs that better fit the different needs of aspiring web developers. Our Onsite Coding Program is a 14-week intensive full-time program where students need to invest at least 70-90 hours per week. Our Online Coding Program is a part-time 20-week program that requires at least 25 hours of dedication per week. As an institution, we continue to grow. Just recently, we opened another campus in East Bay, CA, to reach out to our students there. Currently, the Berkeley campus is offering complimentary workshops for business professionals this coming July 17 and July 28. These workshops aim to give a better understanding of the technologies that operate the web and are free and open to the public. We’ve also improved Coding Dojo by offering full-time and part-time programs that better fit the different needs of aspiring web developers. Our Onsite Coding Program is a 14-week intensive full-time program where students need to invest at least 70-90 hours per week. Our Online Coding Program is a part-time 20-week program that requires at least 25 hours of dedication per week. At Coding Dojo we close skill gaps by continuously improving our teaching methods and always focusing on the student learning experience. We conduct algorithm sessions, data structures activities, coding lectures, group projects and formative assessments. We also provide guidance and help from instructors and teaching assistants as students build and develop their own portfolios. After students finish a particular portion of the program, we move to assessments which take the form of project week and belt exams. During this phase, our students learn to self-sufficient and prepared for the inevitable challenges that will arise when working at fast moving companies. Lastly, we always emphasize that although competition can be good, collaboration is better. We encourage our students to collaborate with each other when they encounter a challenging problem in the bootcamp, because not only does it help students learn more quickly, it also reflects the world experience of working in a team environment. We’ve come a long way since 2013. Where we once could only teach one stack, we have now learned how to teach three stacks effectively. Nowadays, our curriculum offers six of 2018’s most in-demand programming languages: PYTHON, SWIFT, NET, RUBY, MEAN, and JAVA. We provide flexible options with multi-stack curriculum for the onsite bootcamp program as well as the online bootcamp. 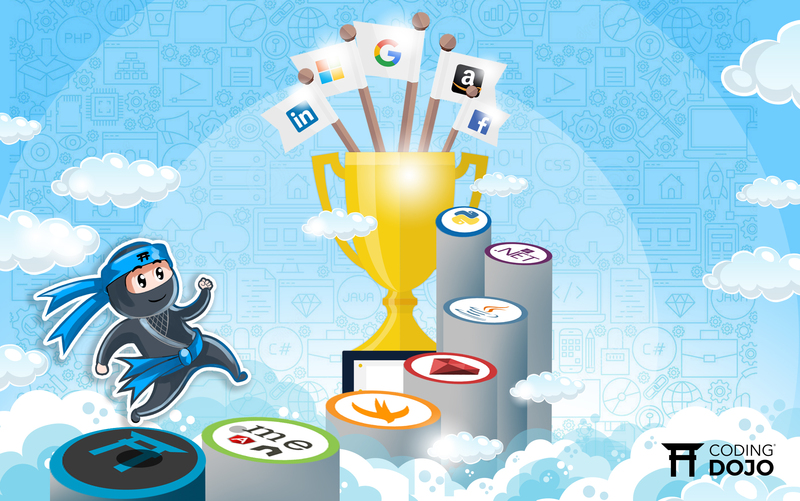 To maintain our high standard, and to stay ahead of the curve we’ll always be improving, constantly reassessing and optimizing Coding Dojo curriculum.